Aflac gets extra credit for a device that's not only clever and useful, but endearing and magnanimous as well. The My Special Aflac Duck is a fluffy, cuddly robot toy designed for kids with cancer. 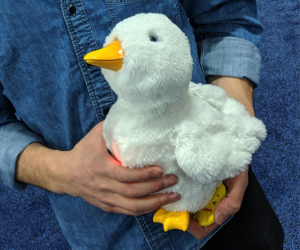 A variety of sensors enable the duck to act as comforting companion, and it even has a PICC line attachment, so the duck can do chemotherapy along with the child. Aflac has a goal of providing one to every child cancer patient in the U.S. The Lenovo Smart Display proves that Google has learned something from its ill-fated forays into hardware. This time, the search giant left it to an expert, and Lenovo has delivered. Powered by Google Assistant, the Smart Display’s 8- or 10-inch screen puts the puny Alexa-driven Amazon Spot and Show devices to shame; it even comes with a formidable 10-watt speaker on its left side. Propped up by a kickstand, the Smart Display’s full-HD screen is easy to read in various lighting. The Smart Display is handy for displaying recipes, making video calls, and responding to Google voice searches. When released this summer, the 8-inch model will cost $200 while the 10-incher will be $250. A carry-on suitcase that propels itself and follows me around airports automatically, never being left behind? Oh, yes, please! The CX-1 suitcase from ForwardX has cameras and smarts that help it avoid obstacles and stay close to its owner. It can do 7 mph, which is almost fast enough for you to catch your connecting flight. The CX-1 can even handle speed bumps, dirt roads, or uphill climbs. It will be available "later this year" but the price tag is still a secret. Seems cool, but I wish it had some sort of tether so I could be sure it stayed with me in a busy airport. Lishtot (are we really running out of pronounceable English product names?) is a keyfob-sized device that magically detects even minute amounts of contaminants or bacteria in drinking water. Its inventor says the Lishtot measures variations in the electromagnetic field surrounding water; different patterns indicate the presence of lead, chlorine, E. coli bacteria, organic chemicals, and so on. Whether they’re in the water, on the container, or on your hands is anyone’s guess, I guess. This $49.95 device is available now. DynaFocals are (or will be, hopefully) reading glasses that automatically change focal length depending on what the wearer is looking at. PH Technical Labs doesn’t explain how DynaFocals work, what they will cost, or when in the “middle of 2018” they will be launched. But at least PHTL is not asking for your contact and credit card data yet. Dojo by Bullguard will protect your home network and the Internet of Things (IoT) devices connected to it, according to its developers. This portable “pebble” seems to contain the Bullguard security software, a WiFi adapter, and an LED light, and it comes with an app. “The pebble is free to move about your home and glows when there is activity that needs to be addressed in the app, and is designed so it doesn't need to be yet another thing you line up next to your TV.” Instead, you can roam around with phone in one hand and pebble in the other until your dog mistakes the latter for a tennis ball and hides it under the couch. To be clear, this totally unnecessary hardware seems intended to be a way to get $199 for software that few would buy after a free trial. A $200 smart mouthguard is “the first real-time head impact monitoring technology,” according to Prevent Biometrics (which is a poor brand name but sounds like a good idea). Years in the making the Prevent mouthguard is now being marketed to schools and pro sports teams who are increasingly leary of legal liabilities arising from competitive concussions, aneurisysms, and the like. One journalist who visited CES came away with the feeling that CES was mostly "useless robots and machines that don’t work." She begins her summary of the show with commentary on a robot that can't fold clothes very well, and ends with this: "A giant banner in the main hallway read 'A better life. A better world.' But all I could think of is how much I wanted to be back home in the real world where, even if it’s primitive, most technology just works." Most recent comments on "[GADGETS] Best of CES 2018"
EDITOR'S NOTE: So noted, thanks! Since it is a device to test if water is safe to drink, I assume the name has something to do with the infinitive of the verb "to drink" (which in Hebrew is ... you might have guessed by now: lishtot). Thanks for the humor as a summary of the show. Glad I missed it. "The company says that infrared light is safe because it’s “natural,” unlike the “dangerous, man-made” radio-frequency radiation that’s been part of the electromagnetic spectrum since the Big Bang." From my point of view you both skipped Physics lessons in school - both things are natural, but the problem with safe level of them. The level of man-made radio pollution is definitely unnatural for human habitat, but the naturally common level of infrared radiation can sometimes naturally kill in the same habitat (remember how many people died last summer from extreme heat in pretty comfortable cities). I don't speak Hebrew but as soon as I read the name I figured it was an Israeli company and indeed as Gabor notes"Lishtot" means "to drink" in Hebrew. The company in based in Jerusalem. I was very interested in the Aflac duck as one of my grandsons was diagnosed with a stage 4 paediatric cancer 3 years ago at the age of 3 months. That duck would have been nice to have at that time. BTW, he's doing fine now. When you can purchase robotic guard dogs as featured in Black Mirror's episode 'Metalhead' let me know. The Lishtot might be just thing for those who partake of the "Raw Water" that has been in the news recently! The one new product that is really interesting to me and probably millions of others. . .the DynaFocal glasses! You only have to really need to use glasses, especially when you are older and wear progressive lens, to want this pair!!! I have to wear regular, cheap reading glasses to use my computer or even for reading a book. The computer is the one that is the hardest to see your computer screen with progressive lens glasses. With progressive lens you have to put your head at an odd angle just to see and just move your head a tiny bit. . .view is gone! When I am driving, I don't have as much of an issue, but even then, I must be careful about how I move my head. For those who wear progressive lens, they know what I mean. And heaven help the poor person who gets a new pair of progressive lens and they are NOT set or fixated right! The distance is too far up the glasses and the reading is almost none existent. Been there. . .done that! I am holding out until the Kohler Numi "smart toilet" comes down a bit from the CES2018 announced price of around $6k. I love the quote: "A giant banner in the main hallway read 'A better life. A better world.' But all I could think of is how much I wanted to be back home in the real world where, even if it’s primitive, most technology just works." I personally don't need a gadget for everything. I love technology, but I also want the freedom to be involved with what I am doing--not a passive guinea pig. Lishtot is Hebrew for 'to drink'. No attempt at a weird name there. Just a different language! Bob, I'm not sure the CX-1 suitcase from ForwardX will get anywhere considering how TSA won't even allow the luggage that has lithium-ion batteries built into them, all to allow owners to track them anywhere -- on any flight now.